Written by Forest Pines; published at 5:24 pm on January 1st, 2013. I don’t believe in round numbers. Other people, though, do believe in round numbers, and I admit I compulsively watch the odometer turn over on the car. Five hundred miles since the start of the trip, you know. So the start of a new year marks a good point to maybe try to start writing things down once again. Not that I have any overinflated enthusiasm about the worth of my words, but more as something I can look back on myself once in a while to find out what I have been thinking about. In which things are squared, and vintage. Written by Forest Pines; published at 9:01 pm on December 17th, 2011. Back in August, I talked about photo framing, and the use of square frames. In fact, if you’re viewing this on the main page, there’s a good chance it’s down below somewhere, I’ve been writing so few posts lately. In essence: nowadays you get a rectangular photo, and it’s very, very easy to crop your photo to whatever aspect ratio you like. Back in the day, you got a square photo,* and if you wanted to crop it you had to take a guillotine to your print. I’ve been trying for a while to be more disciplined with my aspect ratios, and either keep all my shots to the same aspect ratio as the camera uses,** or crop them to square. And, moreover, I’ve had the vintage cameras out. Back in August, I posted a test shot I took to check exposure. Today: the actual shot I was trying to take! This was taken on an Ensign Selfix 420. The one big problem I have with it: getting the camera straight. It has two viewfinders: a glassless frame finder on the body, and a small brilliant finder attached to the lens. The former doesn’t really tell you if you’re pointing it in the right direction, and the latter is too small to see if you’ve got it properly upright. 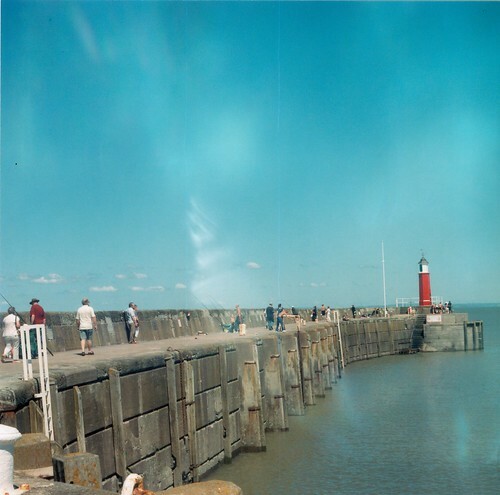 The light leak, on the other hand, I rather like; it’s only noticeable in bright sunlight in any case. * Bear in mind that right through the 1950s 35mm cameras were a relatively rare thing, and the majority of the photo market used 6cm film such as the 120 format. It wasn’t until the 60s that the 35mm camera really started to take over the market, even though they had been around earlier. ** 121:81, in case you were wondering. Written by Forest Pines; published at 8:44 pm on October 23rd, 2011. This blog still gets quite a lot of hits from people searching for the locations used in the BBC supernatural drama series Being Human, particularly the house used in the first couple of series. Now, I wrote quite a bit about those two series on here, partly because at the time we lived in South Bristol, the series was filmed largely in South Bristol, and it was quite an enjoyable thing to watch. The last time I wrote about it, though, was to (successfully) predict one of the plot-lines of Series Three; however, when that series made it onto the screen ,I hardly wrote about it at all. I hardly wrote about it because, to be honest, I didn’t think it was very good. Newport might be awful, depressing and run down, but Cardiff has plenty of areas like that too. So, the next series of Being Human is going to feature: some sort of dramatic, thrilling climax based around the Newport Transporter Bridge. It’s essentially the only unique thing Newport has; and if you’re going to feature it, you may as well be dramatic about it. Well, either that, or the Manic Street Preachers are going to pop up in the background, which is less likely. Noticing that Being Human is coming back, and writing this post, has made me think about exactly why I don’t think it is any good any more; why I think it shouldn’t come back. The biggest problem I have with it, I think, is that its writers don’t really have any sense of how to expand on their fictional world but still retain believability. Each series might make sense on its own, but the three series that have been produced so far, put back to back, make no sense at all as a single work: each new series has introduced new elements which completely break the world already established. If you’ve watched it, you might be wondering what I’m talking about here. So, I’ll elaborate. Stop reading now if you have never seen the programme but might want to watch it in the future. Series one: we have Emotionally-Tortured Pre-Raphaelite Vampire, trying hard to give up on the whole “killing people” thing; and Evil Villain Vampire, who is going to take over the world and doesn’t see any place for brooding emotional types who think they can live alongside humans in his worldview. Evil Villain Vampire is working in the police, so he can keep vampires under-cover and make sure their crimes don’t get exposed. E-T P-R V learns to rely on his friends, who defeat Mr. Evil Villain – in the workplace, note – and forestall the great vampire takeover. Sorted. Series two: E-T P-R V and friends are fighting against some religious “scientists” who are trying to cure evil, and exterminate it if curing it doesn’t work. Our vampire protagonist is still being broody because he’s having trouble with the whole not-killing-people thing again. So, introduce Morally-Uplifted Mentor Vampire, who gave up blood-quaffing as a dead loss some centuries back, and who, way back before the start of Series One, taught Mr E-T P-R Vampire how to not kill people to begin with. Now, this plotline might all make sense if M-U M Vampire (ooh, an apt acronym) lived somewhere exotic, somewhere difficult for a Totterdown resident to get to. *** Or, alternatively, if he’d**** been off on holiday somewhere, out of contact, for the whole of Series One. Touring the Amazon, perhaps, or spending three years trainspotting in Iceland. The only sensible explanation, indeed, is that that was indeed the case and it just isn’t mentioned: because it turns out that M-U M Vampire lives in a very nice house, literally a stone’s throw from E-T P-R Vampire’s workplace – where, remember, the Final Denoument took place in the previous series. Literally a stone’s throw. Not only did Evil Villain Vampire not notice, in the previous series, that an active let’s-not-kill-people mentor character was living two minute’s walk away, but E-T P-R Vampire could have popped round for some advice and a cup of tea in his afternoon break, and still got back to work before anybody noticed. Series Three: the religious chaps have been defeated, the Core Team have moved to Wales, and the Evil Villain Vampire might not have been defeated quite so thoroughly as we all thought. But, what’s this? There are some other vampires! Who may or may not exist, of course. They might be somewhere in the depths of the Amazon, or they might be deeply under-cover in a second police team devoted to making sure vampire killings don’t get exposed. However, all the vampires are well-aware that these Old Vampires may exist, or may be just a myth that vampires pass down from generation to generation. All the vampires are well aware of the myth, even though it was never previously mentioned. In Series One, Evil Villain Vampire was planning to take over the world, was planning to become Vampire King Of The World, indeed, and nobody seemed concerned that there may, just may, be some possibly-mythical Old Vampires who might still be around and might disagree. In Series Three, it turns out, they were working in the same business as Evil Villain Vampire all along! But didn’t think it worth doing a thing about him, didn’t bother stepping in – although we’re presumably meant to assume that they would have stopped things going too far. Basically, my point is that: Being Human hasn’t been thought through. It’s been planned one series at a time, and each time a series is made, the previous one isn’t even thought of. No doubt Series Four will introduce some other new characters: maybe a Great Pack of werewolves convinced that werewolves are going to take over the world, which everyone has heard of before and cunningly forgotten to mention. Or maybe the Old Vampires are going to turn out to include the team’s landlord from Series One, who hasn’t been seen for a while. Either way, something new will no doubt come in, and if the previous series are anything to go by, it will be something which would have made a vital difference to everything that has gone before, if we had actually known about it. I will stop ranting, now. There are ways to do this sort of thing properly, but Being Human is probably beyond recovery. The annoying thing is, it would have been much better if someone had sat down, right at the start, and said: if we do get more than one series, what way will we go? And what do we have to do now, to make sure we can? * Given that several characters are either dead or undead, and one has been “killed off for good” once before only to return when the writers ran short of plot, this is possibly not a useful measure of whether or not it will return. ** It’s hard for me to describe what an awful place Newport is, seriously, without you thinking I’m exaggerating for comic effect. Doctors in Newport have been known to use “move well away from Newport” as a treatment for clinical depression. Visiting Newport (in the 2010s) is like visiting a small town in northern England (in 1985). **** There’s an essay in the implicit and deep-rooted sexism that shows itself in the writing of the female vampires in Being Human, but this is probably not the place for it, and I am not the person to write it. It is, however, no doubt closely related to the vampire-as-sexual-predator archetype. Here, at least, note that only the male vampires are given any chance of redemption other than death; and that the mentor who demonstrates this the most is gay. Written by Forest Pines; published at 1:41 pm on August 29th, 2011. Only a day after the new garden blog went live, I found myself with a problem. This morning, I noticed a problem with it, on K’s PC. Moreover, it was only a problem on K’s PC. On her PC, in Firefox and in IE, the heading font was hugely oversized compared to the rest of the page. In Chrome, everything was fine. Now, I’d tested the site in all of my browsers. On my Windows PC, running Window 7 just like K’s, there were no problems in any of the browsers I’d tried. On my Linux box, all fine; on my FreeBSD box, all fine. But on K’s PC, apart from in Chrome, the heading font was completely out. Whether I tried setting an absolute size or a relative size, the heading font was completely out. All of the fonts on the new site are loaded through the Google Webfonts API, because it’s nice and simple and practically no different to self-hosting your fonts. Fiddling around with it, I noticed something strange: it wasn’t just a problem specific to K’s PC, it was a problem specific to this specific font. Changing the font to anything else: no problems at all. With the font I originally chose: completely the wrong size on the one PC. Bizarre. After spending a few hours getting more and more puzzled and frustrated, I decided that, to be frank, I wasn’t that attached to the specific font. So, from day 2, the garden blog is using a different font on its masthead. The old one – for reference, “Love Ya Like A Sister” by Kimberly Geswein – was abandoned, rather than wrestle with getting it to render at the right size on every computer out there. The replacement – “Cabin Sketch” by Pablo Impallari – does that reliably, as far as I’ve noticed;* and although it’s different it fits in just as well. * this is where someone writes in and says it looks wrong on their Acorn Archimedes, or something along those lines.